suppressed below historical norms and remains upward sloping. These market crisis level easy money policies are still being utilized seven years after the mortgage market crisis. When reviewed in comparison to year 2000 and 2007, you can see the stark difference in the FED policy in 2014. In both 2000 and 2007, the yield curve was flat and inverted in many maturity differentials, as can be seen in the negative 10/2 and 10/5 spreads and positive 10/30 spread in the following table. The exceptionally low interest rate policy for U.S. Treasuries is currently projected to continue into the end of President Obama’s administration. How this can be accomplished without additional QE is a minor mystery to me, but we do know that international money markets are aiding in the on-going demand for Treasuries, even while U.S. investors continue to hold a lower and lower proportions of the publicly traded float of U.S. Treasuries. 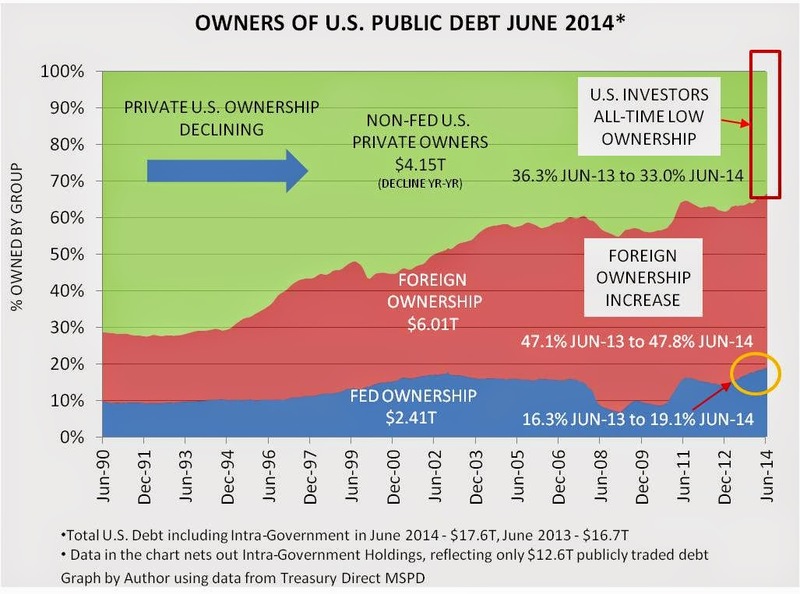 In fact, U.S. based owners have been net sellers of Treasuries over the past year, most likely plowing more money into equities while the Fed buying program and continued international purchases soak up the excess inventory. The announcement of a new QE program being initiated by theECB on September 4th most likely will continue to drive the flow of funds into the U.S. Treasury market from overseas. Until the yield curve flattens substantially, as it did in 2000 and 2007, the stock market is likely to remain at expensive price levels. A below inflation Treasury interest rate environment yields no place to hide for U.S. money managers unless fear rises substantially in the market. The only scenario I foresee producing a major market breakdown without the typical flat yield curve is the dreaded deflationary market spiral which the “world awash in liquidity” policy is being implemented to avoid. You have to go back into the late 1940’s for examples of stock market corrections during an extended ZIRP environment and deflationary market pressures being prominent. In the late 1940 early 1950 market peak scenarios, the FED did not use the Fed Funds rate to tighten credit markets causing an inversion of the yield curve. Instead, the entire Treasury curve would flatten, while business credit spreads would widen relative to Treasuries. 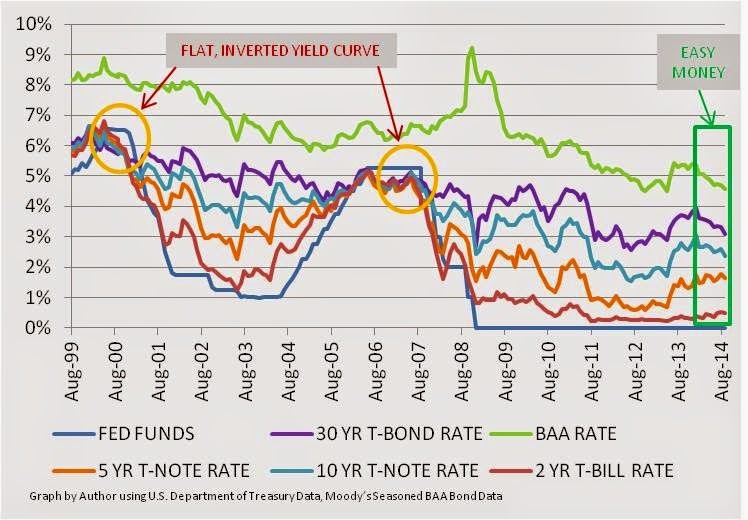 Under the current FED monetary policy, you should not expect a pure yield curve inversion to signal a market peak; but I do expect to see a flattening of the Treasury curve (narrowing of the 10 / 5 Spread) and a widening of spreads between Treasuries and riskier credit (see BAA1 / 30 Year Spread). Presently, the Treasury curve is flattening, but the business credit market has not yet shown a clear deterioration warning signal, but possibly is in progress. The lack of U.S. ownership in the U.S. Treasury market, however, makes the yield curve potentially susceptible to shocks as the Fed changes its policy position moving into year-end 2014. The act of tightening in an environment of weak U.S demand for Treasuries as well as a depressed economic growth in Europe is likely to make the market adjustment to tighter conditions much faster than expected. I expect the stock market to be under selling pressure as this scenario unfolds. DanielMoore is the author of the book Theory of Financial Relativity. 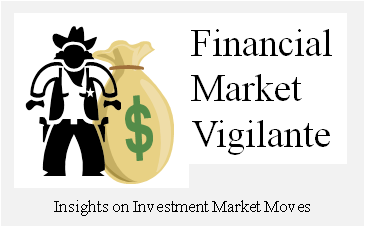 All opinions and analyses shared in this article are expressly his own, and intended for information purposes only and not advice to buy or sell.